Following up with our 2012 and 2013 work with the Los Angeles Business Council, the premier business advocacy organization in Los Angeles County, Urban One co-authored the 2014 LA’s Next Frontier: Capturing Opportunities for New Housing, Economic Growth, and Sustainable Development in LA River Communities with Paul Habibi of UCLA Anderson School of Management and Grayslake Advisors. 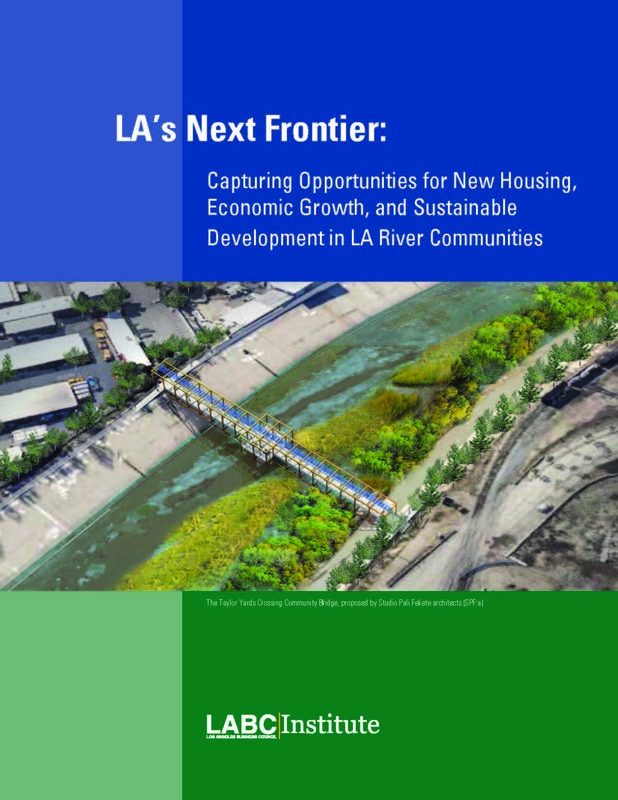 The 2014 Report explores the sustainable economic development potential of the LA River and its surrounding neighborhood. It details the many economic, social, and environmental benefits that can be achieved for the city and its river-adjacent communities through investment in ecosystem restoration and sustainable infrastructure development, including affordable housing. One of the most surprising results of this study was the level of environmental inequity found within our region. According to data from the state’s CalEnviroScreen report, which identifies pollution burden and negative socioeconomic indicators in California communities, nearly 40 percent of neighborhoods within one mile of the LA River fall between the index’s 90th and 100th percentile—the most-burdened ten percent of census tracts in the state. This is double the rate of highly-polluted and demographically vulnerable census tracts in LA County, and nearly four times the rate found in the state as a whole. Restoring the LA River ecosystem and connecting its surrounding neighborhoods with greenway paths, parks, and other sustainable connections and destinations will go a long way toward righting this historic wrong. Revitalization will also bring economic benefits to local residents, many of whom have suffered from the departure of manufacturing and other middle class jobs out of the city. Renewed interest in the river has brought developers and other investors to its banks, and with them come opportunities for providing jobs and services that river-adjacent neighborhoods now lack. The city and region as a whole can benefit from this new investment, as the state, county, and City of Los Angeles unemployment rates all remain elevated above the U.S. average. The report acknowledges that increasing development has the potential to impact housing prices and lead to displacement of existing residents. Mr. Habibi and the LA Business Council Institute therefore identify provision of affordable and workforce housing—in addition to new market rate units—as one of the primary long-term goals for investment in these communities. River neighborhoods can play a major role in helping the city meet Mayor Garcetti’s goal of building 100,000 units by 2021, with room to add 8,000 units per year in river-adjacent neighborhoods in the city, all without dramatically increasing density. With the appropriate planning and financing tools in place, a substantial number of new units could be made affordable to lower-income and moderate-income residents. 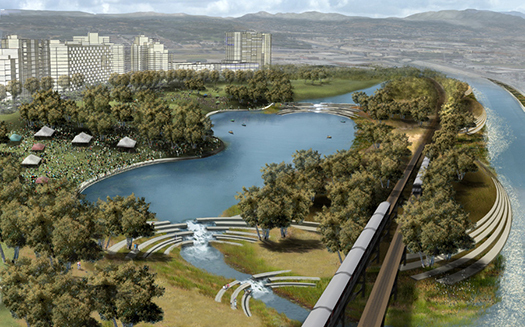 Rendering from LA River Revitalization Master Plan. To pay for ecosystem restoration, sustainable development infrastructure, affordable housing, and other local priorities, the report identifies Enhanced Infrastructure Funding Districts (EIFDs) and stormwater mitigation credits as two particularly promising funding options. EIFDs are able to capture property tax increment revenues and bond against them, similar to the state’s former redevelopment agencies (though with more limitations), and can also raise other funds via fees and assessment revenues. An analysis of the tax increment potential of properties within one mile of the river finds that a conservative increase in property values of 2 percent per year would raise approximately $5.6 billion over 45 years; an “enhanced” growth rate of 3 percent per year would increase revenues to $10 billion over the same time period. [I]magine the owner of a flat parcel of land with high soil porosity. That owner might choose to invest extra funds into stormwater recapture on her site due to the high efficiency of water retention per dollar invested. Having exceeded the average stormwater retention requirement for a parcel of her size, she could then sell a portion of her credits to the owner of a hillside parcel for whom investing in retention infrastructure would be costly and relatively ineffective. Under such a system both parties profit: The owner of the flat parcel is able to earn a profit on the sale of her stormwater retention credits (she earns more from sale of the credits than it cost to build the additional retention infrastructure), and the owner of the hillside parcel is able to purchase the credits at less expense than it would cost to build additional retention infrastructure on his unwieldy site. Communities and the local government also benefit: They achieve at least the same level of total water recapture as if each site had managed its stormwater recapture independently, and they reduce the risk that onerous environmental regulations will prohibit otherwise productive redevelopment that increases the supply of housing, creates jobs, and contributes to a stronger tax base. This latter recommendation comes at an important time, with the entire state in drought and Governor Brown recently imposing across-the-board cuts on urban water use. As one panel member at the LA Business Council Sustainability Summit noted, opportunities for the use of cap-and-trade programs to improve resource efficiency aren’t limited to stormwater recapture, and could be applied to other efforts such as water conservation for the mutual benefit of property owners and policymakers—we would add, however, that this is dependent on thoughtful, strategic implementation. 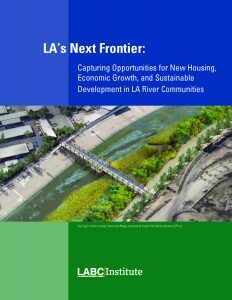 The report concludes with a discussion of several important planning tools and policy reforms that could be used to complement the above funding sources, and a recommendation for two “pilot districts” in which these tools could be applied: Studio City-North Hollywood, and Northeast LA, including parts of Atwater Village, Lincoln Heights, and Highland Park. The tools in this “developer’s toolkit” include reforms to the density bonus program, the use of local design guidelines, and by-right development for projects that conform to rules and guidelines laid out by the community; we hope to explore these and other aspects of the report in greater detail in the weeks to come. Project Facts Report research & writing for business advocacy group. Interviewed numerous private stakeholders & public policymakers to make recommendations.